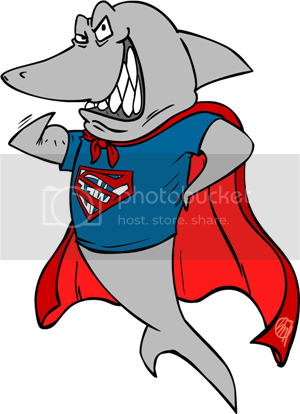 Courtesy of talented and gracious comic book artist Lauren Monardo, Great White Snark now has a new official mascot gracing the top title header of the blog! The words “frigging” and “awesome” come to mind. Repeatedly. You can check out more of Lauren’s work in the graphic novel Jesus Hates Zombies (soon to be reviewed on this here blog) and in the galleries on her ComicSpace page. (I’m partial to her interpretations of classic Batman villains, of course.) You can keep up with her on her blog. Many thank yous to Lauren and to Stephen Lindsay, writer of Jesus Hates Zombies and friend to Great White Snark, who so kindly arranged this project. So what do you think?? Ain’t he handsome? Too cool for words my friend. His bicep is almost as big as yours.